The other day, my husband came to the table with some startling news: research has shown that potato chips are the world’s most fattening food. He assured me that this conclusion was the result of a highly reputable study, conducted with a very large number of participants, over a number of years, and their data was carefully recorded and analyzed and normalized and blah, blah, blah. It’s official. Potato chips are the devil. But after reflection, I’ve changed my mind. I don’t think potato chips are the true culprit in the epidemic of obesity. Why? Well, potato chips haven’t changed much over the course of my lifetime. Except for some new flavours, they’re still pretty much what they always were. Pizza, on the other hand, has been mutating like a malevolent virus, with the clear intention of fattening us all up. I’m not sure who’s behind this vicious plot. Maybe the pizza joints are all secretly owned by big pharmaceutical companies. That’s it. Pizza is evil. Update: Yes, I drew the cartoon myself. Yay, stick people! Ah, pizza. I know exactly what you mean! They are evil, but if you have to choose between a pizza or a lettuce leaf, somehow the pizza always wins. I feel your pain. I never order pizza at the chains, either. Good luck with your quest. I know how you feel. 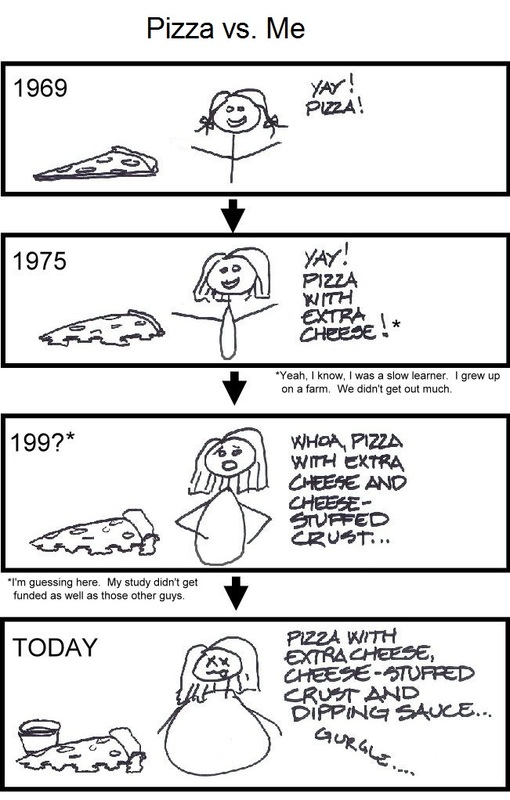 You missed out the part about back in the early 80’s there was no Thick crust, only thin, still my favorite (Pizza Place Cheese only pizza on a thin crust Yummo). Less carbs. Now they try to pull you in with pizzas that sound healthy with toppings like spinach, Feta cheese, Pesto, chicken, etc. Still fattening. Now they also add oil to the outside of the crust when they cook it so it “browns” more evenly. I see it as more fattening calories. I know you will enjoy your Pizza! Hmmm, good point about the thick crust. And hubby pointed out that I also missed out pizzas that are folded in half and sealed around the edges so they hold more fatty goodness. Sigh. Need better funding for the next study.